The Law Offices of H. Davis North is a criminal defense firm based in Greensboro, North Carolina. Don't gamble with your freedom Since 1980, The Law Offices of H. Davis North has been devoted exclusively to helping clients defend against criminal charges. Mr. North has received top awards from his peers and professional community for his legal abilities and ethical standards. He has helped many criminal defense clients resolve their legal troubles by guiding them through the process with experience, competence, and honesty. Above all else, Mr. North works tirelessly on behalf of his clients in order to deliver optimal results. The Law Offices of H. Davis North welcomes all clients facing criminal charges, from district courts to the Supreme Court. Casework the firm handles includes, but is not limited to: General criminal defense Environmental crime White-collar crime Felonies and misdemeanors Contact H. Davis North today If you are facing criminal charges, do not delay in speaking with an established criminal defense attorney. The Law Offices of H. Davis North is waiting for your call and eager to help. Call the firm at (336) 275-1231 or use this website's online contact form today. 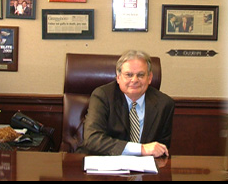 H. Davis North began his career as an assistant public defender in Guilford County and entered private practice in 1982. He practices all facets of criminal law in both state and federal courts. His trial experience includes successful representation in capital cases, white-collar crime, violent and nonviolent felonies and DWIs.